On the basis of modern knowledge, pulmonary vein (PV) and non-PV triggers consist of main target in atrial fibrillation (AF) ablation. The role of persistent left superior vena cava (PLSVC) in etiopathogenesis of AF is still sparse. This report presents the reasonable approach to ablation of persistent AF in a case of PLSVC with the absence of right superior vena cava (RSVC). A 58-year-old female with a history of drug refractory symptomatic AF for 6 months was referred to our institution for ablation. Transthoracic echocardiography demonstrated normal cardiac structure, and physical examination was unremarkable. Preablation transesophageal echocardiography (TEE) was deferred because of otherwise relatively low-risk features at the time of ablation (paroxysmal AF substrate, presentation in sinus rhythm, and the patient being on uninterrupted rivaroxaban). After placement of a duodecapolar coronary sinus catheter, a J-tipped guidewire could not be advanced to the RSVC during fluoroscopically guided transseptal puncture attempt. To allow direct visualization of the transseptal needle tip within the fossa ovalis, we decided to use TEE guidance which demonstrated the absence of RSVC and dilated coronary sinus. To reveal cardiac venous anatomy, an angiogram of the right atrium was performed and confirmed the existence of PLSVC with absent of RSVC [Figure 1]a and [Figure 1]b.
Transseptal puncture was performed under the guidance of TEE, and a cryoablation (CA) catheter was inserted into the left superior PV. Before starting CA in the PVs, a duodecapolar catheter was inserted retrograde through the coronary sinus into the PLSVC. Entrance block was observed in PLSVC which confirmed AF was not triggered by PLSVC [Figure 2]. 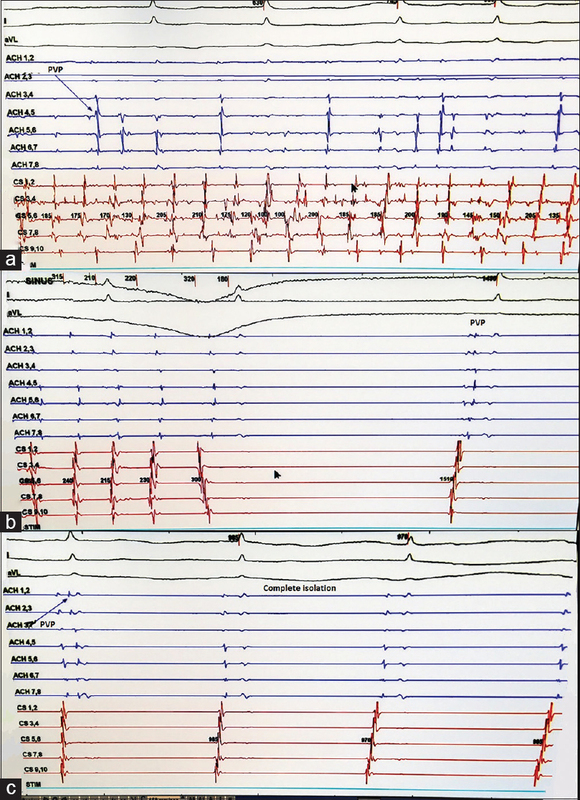 During CA of the left superior PV, AF was first organized and then terminated to sinus rhythm [Figure 3]a,[Figure 3]b,[Figure 3]c. Other PVs were isolated using a double-freeze method with each application lasting for 180 s. After completion of PV isolation, the pacing was performed through PLSVC with maximal energy. It verified the existence of exit block. Dormant conduction was not observed and burst pacing attempts did not induce AF with isoproterenol infusion (3.3 μg/min). Postprocedural computed tomography angiography confirmed the existence of PLSVC with the absence of RSVC [Figure 4]a and [Figure 4]b. Although transseptal puncture under fluoroscopic guidance may have a reasonable safety profile in experienced hands, serious complications such as cardiac tamponade (1.31%) or aortic perforation can still occur and can lead to death (0.15%)., To deal with these possible complications, transseptal puncture should be done under TEE or intracardiac echocardiography guidance. The use of echocardiographic guidance for transseptal puncture does not only enable a safe procedure but also enables puncture site selection within the fossa ovalis according to the expected procedure type (e.g., a more anterior puncture for ablation of an accessory pathway at the mitral annulus or more posterior puncture for ablation of AF). Furthermore, the possibility of safely initiation of anticoagulation before transseptal puncture may be another important advantage of echocardiographic guidance. As a conclusion, PLSVC is an anomalous structure may cause procedural challenge and additionally may serve as a substrate for AF. Despite, the dominant trigger for AF is usually non-PVs in PLSVC cases; it should be kept in mind to check electrical activity of anomalous PLSVC before attempting empirical ablation. Haïssaguerre M, Jaïs P, Shah DC, Takahashi A, Hocini M, Quiniou G, et al. Spontaneous initiation of atrial fibrillation by ectopic beats originating in the pulmonary veins. N Engl J Med 1998;339:659-66. Shah D, Haissaguerre M, Jais P, Hocini M. Nonpulmonary vein foci: Do they exist? Pacing Clin Electrophysiol 2003;26:1631-5. Gaita F, Scaglione M, Ferraris F. Left persistent superior vena cava as a source of focal atrial fibrillation. Eur Heart J 2010;31:1689. Abrich VA, Munro J, Srivathsan K. Atrial fibrillation ablation with persistent left superior vena cava detected during intracardiac echocardiography. HeartRhythm Case Rep 2017;3:455-8. De Ponti R, Cappato R, Curnis A, Della Bella P, Padeletti L, Raviele A, et al. Trans-septal catheterization in the electrophysiology laboratory: Data from a multicenter survey spanning 12 years. J Am Coll Cardiol 2006;47:1037-42. Kautzner J, Peichl P. You get what you inspect, not what you expect: Can we make the transseptal puncture safer? Europace 2010;12:1353-5. Erden İ, Erden EÇ, Golcuk E, Aksu T, Yalin K, Güler TE, et al. Impact of transesophageal echocardiography during transseptal puncture on atrial fibrillation ablation. J Arrhythm 2016;32:170-5.